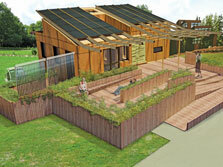 The Lawrence Tech house is called "ALOeTERRA" to reflect its healing effect on the Earth. It features a central solar chimney, extensive solar electric panels on the roof, and solar thermal collectors extending from its west side. For some teams coming to the Solar Decathlon for the first time, the challenges of designing a home, raising funds, procuring equipment, and actually building it and bringing it to the National Mall are enough to deal with. Not so for Michigan's Lawrence Technological University, which is aiming to achieve far more than the competition's requirements. "All of the design choices that we're making and all of the technical choices that we're making are really taking into consideration not only what's good for the competition, but what's good for the environment," says Christina Span, an architecture student. That includes drawing on locally sourced, sustainable materials, such as decking material made of a composite of rice hulls and polymer. It also means packing the small house chock-full of technology. To achieve this mix required the close collaboration of engineering and architecture students, most of whom had never worked together before. Lawrence Tech's cross-disciplinary team has generated four senior projects for undergraduates, as well as one graduate project. For the architecture students, nearly all are now considering graduate schools with design/build programs, because they realize the benefits of seeing a project through to its final construction. "That's across the board, as far as the architecture students that have gotten involved," says Span. The project also has the strong backing of the school, and most important, the school's alumni. A special campaign sparked the interest of the school's alumni and yielded significant funding for the team. "We had one of the largest alumni-giving campaigns ever," says Assistant Professor Philip Plowright, who teaches in the College of Architecture and Design. "We've had people give to the university who have never given anything before, because they heard we were doing this."